Plurality is a short movie directed by Dennis Liu and there is just one word to describe and that is awesome. The film is about a dystopian future and as a computer scientist there is a part of you that wants to help building such a privacy hazard and there is a another freedom loving part that wants to prevent such a future no matter the cost. The special effects are also quite good for a movie that is distributed on the internet for free. So watch the movie and let me know if you like it too. Abstract: A fundamental unit of work in programming is the code contribution (“commit”) that a developer makes to the code base of the project in work. We use statistical methods to derive a model of the probabilistic distribution of commit sizes in open source projects and we show that the model is applicable to different project sizes. We use both graphical as well as statistical methods to validate the goodness of fit of our model. By measuring and modeling a fundamental dimension of programming we help improve software development tools and our understanding of software development. Keywords: Open source; commit sizes; commit size distribution; configuration management; code contributions. Reference: Carsten Kolassa, Dirk Riehle, Michel A. Salim. “A Model of the Commit Size Distribution of Open Source.” In Proceedings of the 39th International Conference on Current Trends in Theory and Practice of Computer Science (SOFSEM 2013), LNCS 7741. Springer Verlag, 2013. Page 52-66. The Terminator: The Skynet Funding Bill is passed. The system goes on-line August 4th, 1997. Human decisions are removed from strategic defense. Skynet begins to learn at a geometric rate. It becomes self-aware at 2:14 a.m. Eastern time, August 29th. In a panic, they try to pull the plug. John Connor: Why attack Russia? Aren’t they our friends now? The Terminator: Because Skynet knows the Russian counter-attack will eliminate its enemies over here. But progress is beeing made. IBM simulates 530 billon neurons (53×10^10 neurons), 100 trillion synapses (1.37×10^14 synapses) on world’s fastest supercomputer. So in short IBM simulates more neurons as the human brain has and roughly the same number of synapses. Awesome! Now the big question is, is it realtime or even faster than realtime? It is slower, 1542 times slower to be exact. If you like robots you will most likely like this video. It shows DARPA’s Pet Proto navigating obstacles. Technical Support joke. Old but still funny. 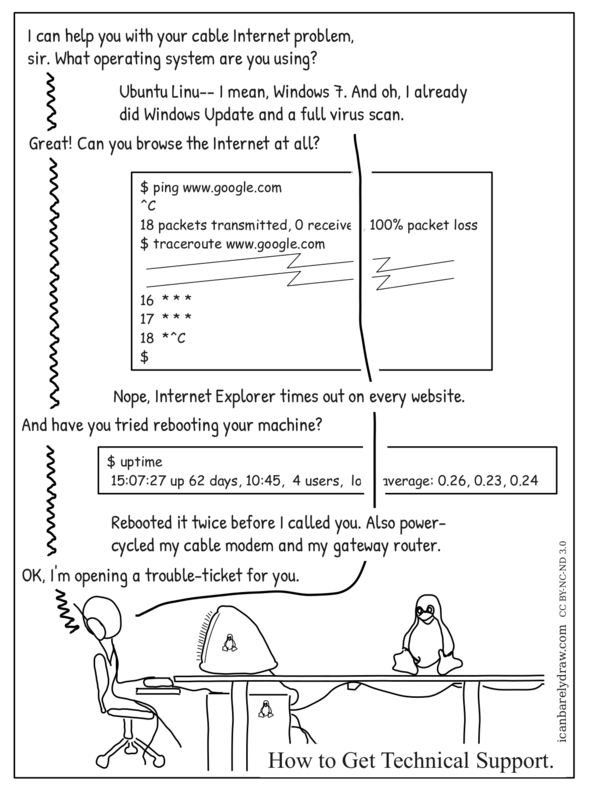 Technical support joke, old but still funny. 100 years of East London style in 100 seconds.